Rod wants the impossible: a vehicle that&apos;ll tow a pretty decent sized caravan, but that doesn&apos;t feel like a truck to drive. Rod is looking for a capable tow vehicle that can handle a 2500kg caravan, but here&apos;s the thing - it can&apos;t be truck-like to drive. To quote Rod: "I have a desire that the vehicle drives well on our sealed roads and not like a truck, and not feel every minor road perversion". Or, said another way, "I suppose it should be soft riding rather than a rigid monster hard rider". 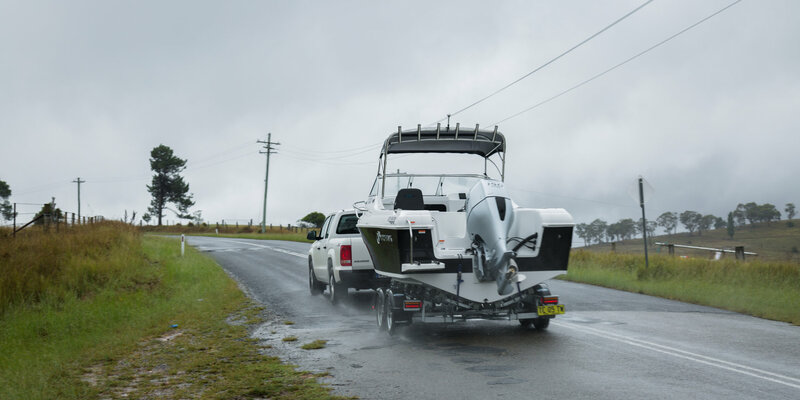 Rod doesn&apos;t need it to be four-wheel-drive, either, though for that sort of towing ability, it may end up that the best option is 4WD anyway. The vehicle will be used to tow for about three months per year, and will also be the only car Rod and his partner will have, so it needs to be suitable for regular running around, too. It doesn&apos;t need heaps of seats for extra family members - it&apos;s a car for the two of them. While the reach of the Toyota dealership network and the brand&apos;s penchant for reliability is hard to argue against, the comfort levels of the Toyota HiLux and Fortuner fall short. The Isuzu D-Max and MU-X also have good cred for towing, but don&apos;t hit the need for being car-like. Those few options a bit unsophisticated in terms of outright road manners, while another one that&apos;s good-but-not-good-enough is the Mitsubishi Pajero Sport. The Jeep Grand Cherokee could be a possible option, but it breaks the budget. In fact, the vast majority of extra-cab and dual-cab utes meet the criteria: the Nissan Navara could be considered, but we&apos;re not sure it&apos;ll be comfortable with that much weight behind it, and its steering is pretty truck-like. But we&apos;ve got one ute on the list that could hit the mark. It&apos;s a real shame about that down-weight requirement, because it&apos;s clear there&apos;s a desire for something that isn&apos;t a big cumbersome SUV or ute, and the impressive Volkswagen Tiguan - in either of the two diesel tunes available (110TDI or 140TDI) - is capable of towing up to 2500kg... but it has a tow-ball down weight of just 100kg. Bugger. A Holden Commodore could have been an option, too, but the max towing capacity is 2100kg (210kg down weight), while a Volkswagen Passat Alltrack has a 2200kg payload - but a measly 90kg load limit on the bar. Anyhoo, here is The Shortlist for Rod. It&apos;s as though the Ford Everest - in base Ambiente RWD guise - was made to fit the needs of Rod and his partner. It&apos;s sub-$50k ($47,990 plus on-road costs), it isn&apos;t 4x4, and doesn&apos;t necessarily drive like a big truck. It has five seats and a big boot, too. The weird thing is that the Everest is quite large, being based on the Ford Ranger ute, but it doesn&apos;t drive big because of its terrific steering, which is light when you want it to be but builds a bit of weight and feel to it when you&apos;re at higher speeds. The ride comfort of the Everest - which employs a five-link Watt&apos;s Link rear suspension setup with coil springs - is very good, and while a really heavy load can see a bit of back-end sag to the suspension, it deals well with weight behind it, and it has a 3.0-tonne braked capacity. Under the bonnet is a strong 3.2-litre five-cylinder turbo diesel engine with 147kW of power and 470Nm of torque, which - as we&apos;ve found when we&apos;ve doing towing tests with the Everest - is more than capable of dealing with big mass attached to the back. The mirrors offer great vision from the driver&apos;s seat, and it comes with a rear-view camera with a zoom function, and rear parking sensors, too. The Everest has Ford&apos;s Sync 3 media system with the latest smartphone tethering (Apple CarPlay and Android Auto). We&apos;ve said this before, but the Volkswagen Amarok is one of the most car-like utes we&apos;ve driven - and it can tow really well, too. 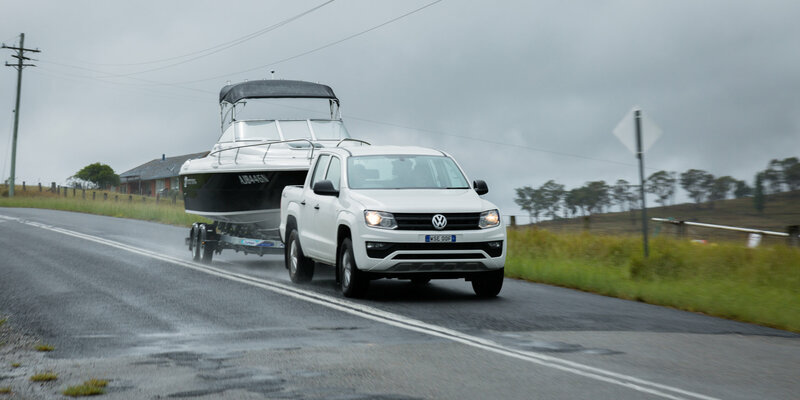 Well, there&apos;s no doubt that the Amarok V6 would be a better option for those who tow a lot - I recently drove one from Perth to Sydney and was amazed at the effortlessness of the drivetrain - but that&apos;ll require the budget to stretch to $55,990 (drive-away) for the new Sportline model. The price point that Rod is looking at would mean an all-wheel-drive Amarok Core with the brand&apos;s 2.0-litre turbocharged four-cylinder diesel engine might be the option he&apos;d go for, as it starts at $40,990 drive-away for the manual or three-grand more for the excellent eight-speed auto. Considering all-wheel-drive isn&apos;t necessary to Rod, he could consider the entry-level, rear-drive Amarok model, which is priced at $38,990 drive-away - well under budget. And even though it&apos;s the base model in the range, it still comes with a touchscreen media system with smartphone mirroring, but no sat-nav. A rear-view camera and parking sensors are available, but optional. But the buy-in is a fair bit lower than its aforementioned rival. It has the four-cylinder engine and a standard-fit eight-speed automatic, and as we&apos;ve found with the Amarok, one of the best balances of composure and comfort in the dual-cab ute segment. Another biggish SUV is our third suggestion for Rod&apos;s needs. There are three versions available - the LT, the LTZ, and Z71. Only the LT comes in under budget, at $47,990 plus on-road costs - but deals are being done, and you&apos;ll regularly spot this model at $45,990 drive-away. This one, like the Ford, has great manners for those in the cabin. The Trailblazer glides over ruts and corrugations, partly because of Holden’s extensive focus on ride and handling tuning on rubbish Aussie roads. The Trailblazer&apos;s electrically-assisted steering rack offers adequate feel and is light enough to easily manoeuvre it, too. The 2.8-litre four-cylinder turbo diesel engine has 147kW of power and 500Nm of torque, and you can really feel that urge under throttle: the response is great, and the six-speed automatic is a very well sorted gearbox. The SUV&apos;s grade logic control has also been finely tuned to shift back through gears when moving downhill, which is very handy when towing. Catch our Trailblazer towing review for more. A rear-view camera and rear parking sensors are standard, and it has a touchscreen with Apple CarPlay and Android Auto phone mirroring, but navigation isn&apos;t fitted in this spec. The big &apos;hmmmmm&apos; moment for Rod might be servicing. Holden requires all of its models to be taken to the dealer every nine months or 15,000km, which seems like a bit of an ask - especially for a diesel. It&apos;s a real shame - but we couldn&apos;t overlook the Trailblazer&apos;s other merits.